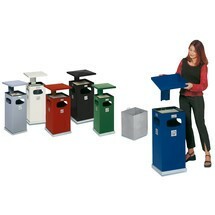 The waste bins with ashtrays are available in 2 sizes and different colours. The canopy is detachable and secured with a lock against unauthorised removal. The VAR® ashtray/waste bin combination, stainless steel, pedestal model is made of brushed stainless steel and has a galvanised steel sieve, enabling you to quickly and easily remove the cigarette butts from the sand. 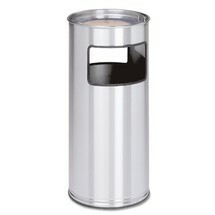 The VAR® ELEGANT combi ashtray is a waste bin and ash collector all in one. 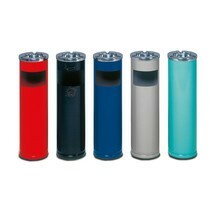 It ensures that your premises will be more clean than before. The removable ashtray liner also makes it quick and easy to empty. 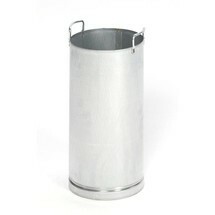 The VAR® ashtray/waste bin combination, stainless steel, 21 litres, has a removable ash and inner liner in stainless steel. 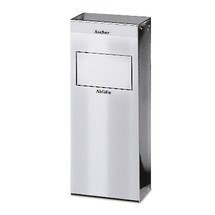 The ashtray/waste bin combination is suitable for use both indoors and outdoors. The inner liner for the stainless steel waste bin makes it easy to remove the contents. The waste bin itself therefore remains free of dirt and contamination.